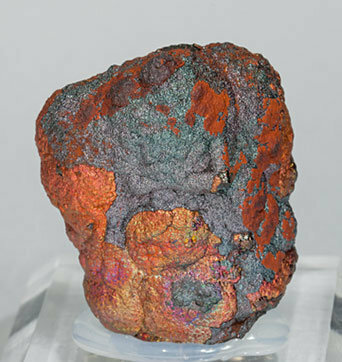 Botryoidal growths with intense metallic-iridescent patinas, very bright and showing strongly contrasting coloration, with dominant red, yellowish and orange shades. These growths contrast with a later phase with smaller and grayish botryoidal forms. The sample is from a famous 2007 find. 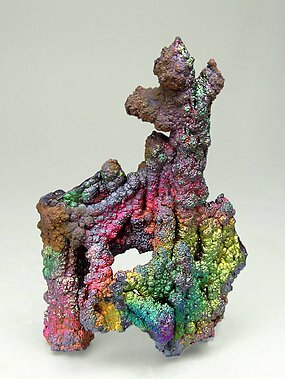 Botryoidal stalactitic aggregate with intensely metallic-iridescent patinas, very bright and showing strongly contrasting coloration, with dominant yellowish and orange shades. These growths contrast with a later phase with smaller and grayish-red botryoidal forms. The sample is from a famous 2007 find. 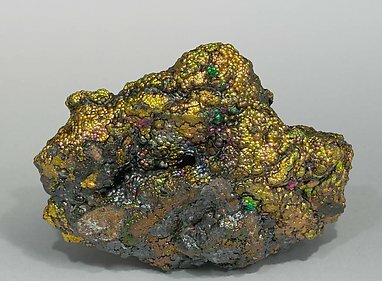 Extraordinarily bright botryoidal aggregate with some iridescent areas with predominant yellow and blue shades. 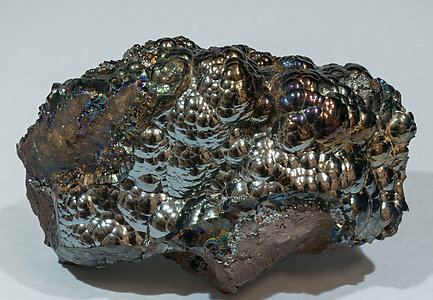 The sample is from a locality considered a Spanish classic for Goethite, but where such bright samples with iridescent surfaces were quite rare. 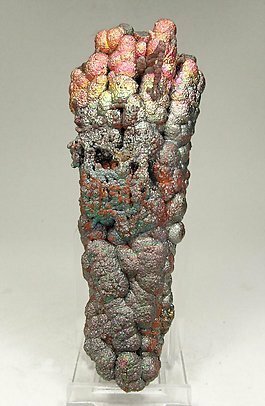 Stalactitic botryoidal aggregate with intensely metallic-iridescent patinas, very bright and showing strongly contrasting coloration, with dominant reddish and orange shades. These growths contrast with a later phase with smaller and grayish botryoidal forms. The sample is from a famous 2007 find. 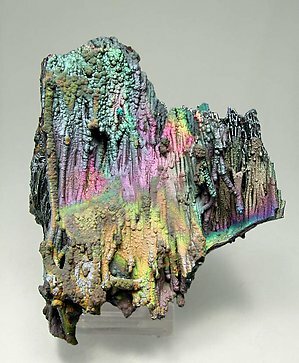 Botryoidal and stalactitic Goethite growths with dappled metallic iridescences with greenish, yellowish and reddish dominant shades. 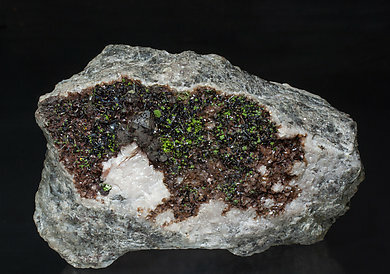 The sample is from a punctual find in a mine without acces currently, so, likely no new samples will be obtained from there. 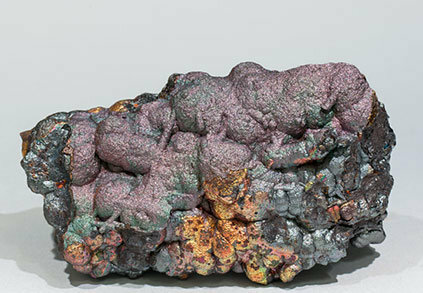 Small botryoidal growth on a matrix of the same Goethite, with iridescences of very vivid colors and predominating reddish shades. The sample, from a very unique find in 1980, it comes from a Spanish private collection. 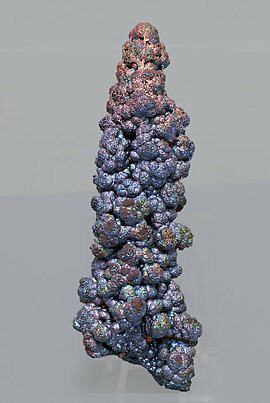 Very aerial parallel columnar growths with strongly iridescent areas that have a dominant green color, with red and blue on the tips and on the base. Velvet Goethite from an old classic Spanish locality which is no longer productive. All of us were there when we were younger digging and trying to get something as good as this delicate specimen. 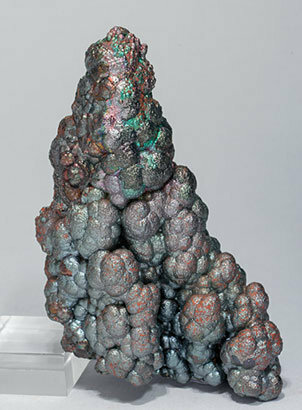 Botryoidal and arborescent growths with intensely metallic-iridescent patinas showing strongly contrasted coloration, between pink-mauve and greenish and bluish shades. These samples have more elegant forms that those that are better known from Filón Sur, at Tharsis, and they are very rare because they appeared in the year 2008, and quickly disappeared from the mineral market. 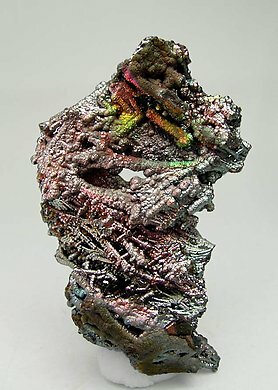 Fine columnar aggregates with patinas forming banded areas with vivid iridescent luster and strongly contrasted shades, predominating red, green and yellow. These samples have more elegant forms that those that are better known from Filón Sur, at Tharsis, and they are very rare because they appeared in the year 2008, and quickly disappeared from the mineral market. 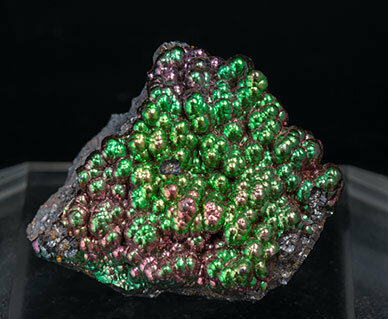 Botryoidal Goethite aggregates with a metallic iridescence and aggregates of small lenticular Azurite crystals and velvety aggregates of acicular Malachite crystals. 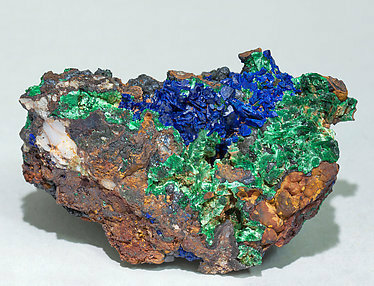 We especially note the locality, now extinct, and the association of Malachite and Azurite with the Goethite. 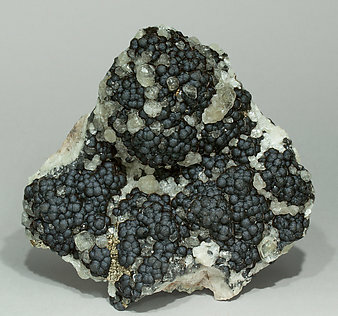 Very well defined botryoidal, almost spheroidal, growths of grayish black Goethite with transparent Calcite crystals, with small cubic Pyrite crystals, and on matrix. 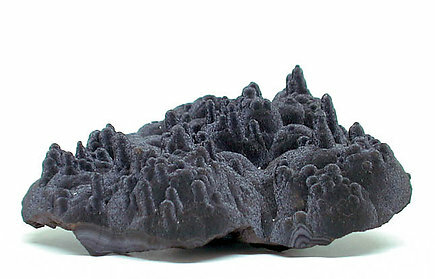 The Goethite has been analyzed and we’ll send a copy of the analysis to the buyer. We regret we can not provide more precise details about the locality but, as frequently happens with Chinese material, the origin remains unknown. Small acicular Goethite crystals, very bright and with reddish reflections due to its pleochroism. They are on a matrix with Quartz crystals, some of them doubly terminated, and with small botryoidal Conichalcite aggregates. Different than most of the usual samples from the Bou Azzer area. 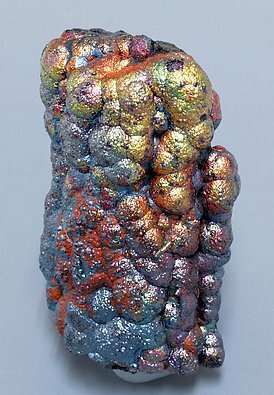 The iridescent Goethite from Rio Tinto is different from the Tharsis iridescent Goethite, it is not stalactitic and is much more colorful. 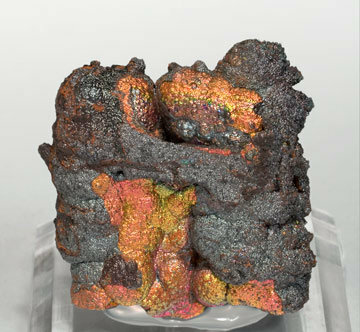 From an old find at the classic Rio Tinto mines, this Goethite surprises us with its rich and varied colors. 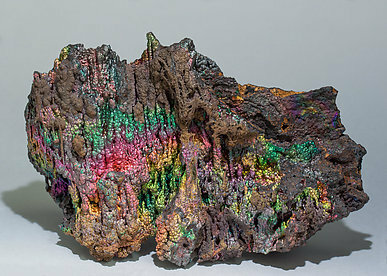 From an old find at the classic Rio Tinto mine, this Goethite surprises us with its rich and varied colors. 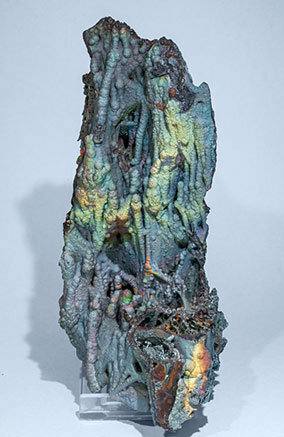 Stalactitic-botryoidal growth with intense iridescence, very bright, metallic reflections, whose dominant colors vary between red, blue and gold. These growths contrast with a later formed phase with smaller and very bright botryoidal growths. The specimen is from a recent find in Tharsis. This locality hasn't produced significant samples in the last twenty years. Stalactitic-botryoidal growth forming curious concretions and elongated growths. 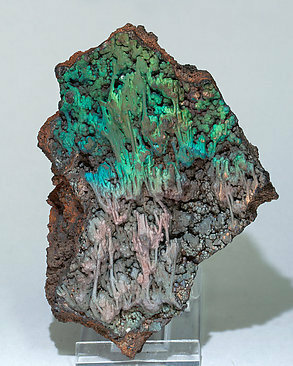 With intense metallic pastel color iridescence and a later formed phase, also with intense iridescence. A novelty from Munich 2007. 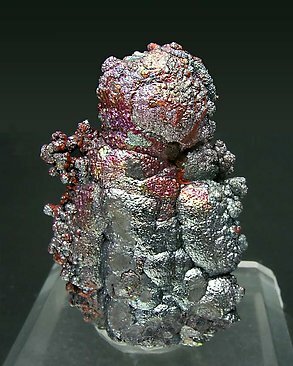 Stalactitic-botryoidal growth with intense, very bright, iridescence, of dominant colors between pink and red and bluish. On the back it has laminar concretions, also iridescent, formed latterly to the botryoidal phase. The specimen is from a recent find on Tharsis (Filón Sur Mine) that hasn't produced significant samples in the last twenty years. A novelty from Munich 2007. 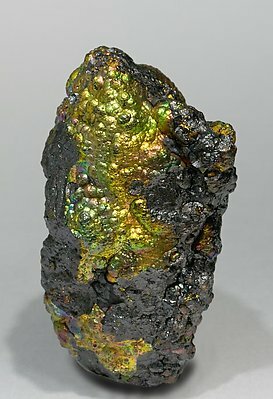 Stalactitic-botryoidal growth with intense, very bright, iridescence, with metallic reflections of dominant colors between golden and blue. The specimen is from a recent find on Tharsis (Filón Sur Mine) that hasn't produced significant samples in the last twenty years. 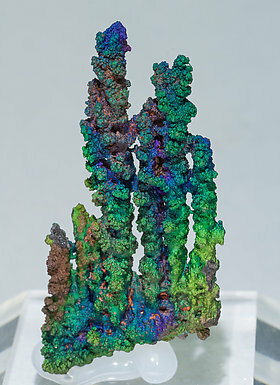 The colorful Goethite from Tharsis is a classic in Spain. From the find of 2007, this one is a fine example of its quality. 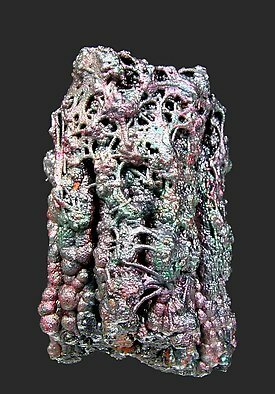 If the Tharsis Goethite samples are well known for their intense colors and defined stalactitic growths, La Lapilla Goethite specimens stand out because of their delicate crossed stalactitic growths and filament-like structures. Also, a highlight is the pale pastel color iridescence, whose colors vary between green, deep blue to slight pink, and gray reflections with ocher zones. La Lapilla Mine is well known by the rich base metals “gossan”, above all its high Gold content, but is not so known for Goethites. If the Tharsis Goethite samples are well known for their intense colors and defined stalactitic growths, La Lapilla Goethite specimens stand out because of their delicate crossed stalactitic growths and very thin filament-like structures. Also, a highlight is the pale pastel color iridescence, whose colors vary between green, deep blue to slight pink, and gray reflections with ocher zones. I will get sentimental about this one. While it is not a top quality specimen (I don’t want to fool anyone into thinking it is) it was one of the first that I added to my own collection. Recently I got a better example, so I have decided to sell this one - with the original label from my collection: number F-33. I bought it during a trip to Morocco with my brother in 1974, when I did not even know what the mineral included in the Quartz was. 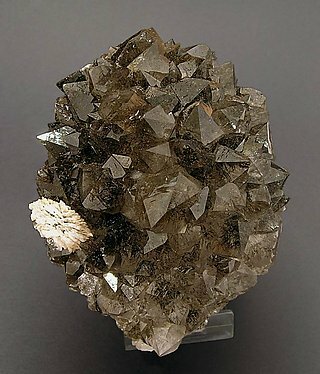 The great collector from Barcelona, Joaquín Folch, told me that, based on the pleiocrism, they are crystals of Goethite. Anyway, apart from the history, I have always liked this one and I still think that the spray of Baryte and blobs of Quartz at the rear make it neat. As you would expect, we will send my label to the person that buys this.